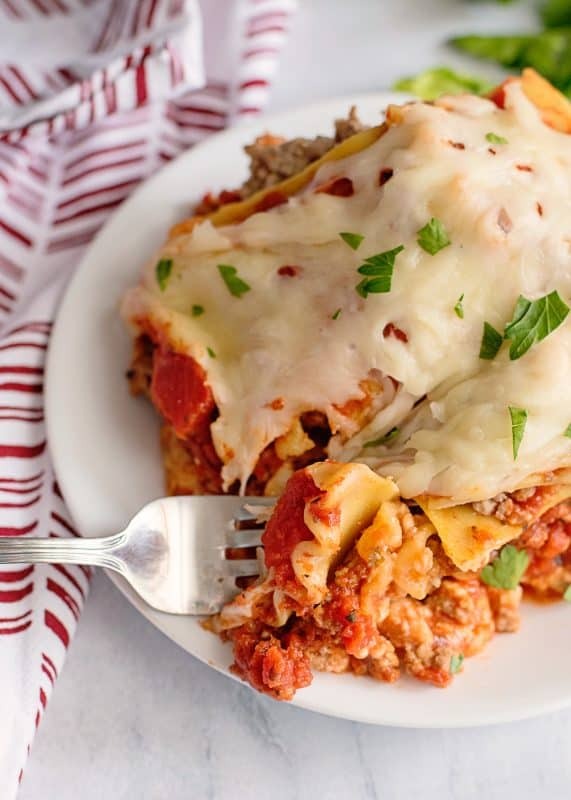 Crock Pot Lasagna just might become your “go to” recipe! I am a HUGE lasagna fan. It was one of the first suppers I “cooked” as a kid, although I didn’t actually do anything. Mama would assemble a lasagna the night before and put it in the fridge, uncooked. Since lasagna takes so long to cook, my job was getting it in the oven when I got home from school so it would be ready in time for supper. Most of the time that went off without a hitch but I will tell you that Mama quickly learned not to cover it in plastic wrap! How many of y’all know how strong the smell of burning cling wrap is from firsthand experience? A distracted tween is not the best at following the details in instructions. She only did that once, though. From then on, she covered it in foil just in case I forgot to remove it. Do you have any fun kitchen mishaps like that? 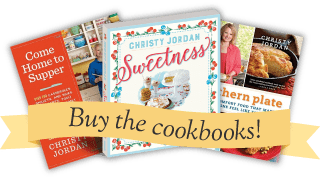 I find that most of us have a kitchen story or two from our early days of cooking and from time to time we make a new mistake memory that is worth retelling in our later years, too! I’d love to hear them in the comments if you have any you’re willing to share! Whenever I make a lasagna today, I make mine in the crock pot. There is no need to cook the noodles ahead of time and I usually have precooked beef in my freezer so it’s just a matter of assembling it in the morning and turning the slow cooker on. My husband comes home to a delicious smelling house and all I have to do is serve it up. 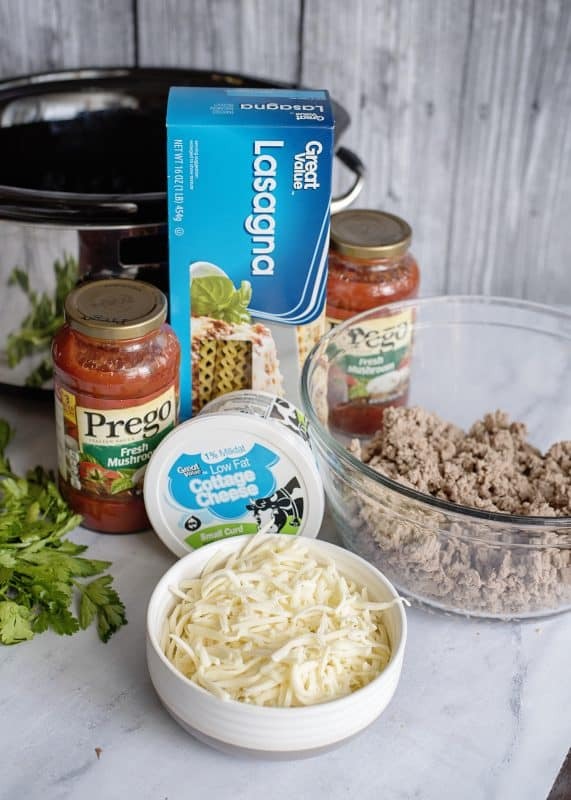 If you’ve never made crock pot lasagna, you may find yourself making it this way from here on out! To make this, you’ll need: Spaghetti sauce of your choice, lasagna noodles, cooked ground beef, mozzarella, and cottage cheese*. That’s it! *If you balk at cottage cheese you can substitute ricotta. Go with what makes you happy! Those are the only substitutions I’ve ever made myself to this recipe so I can’t recommend any others. In a medium bowl, stir together both cheeses. If you haven’t browned your beef yet, now is the time to brown and drain any grease from it. Now let’s assemble our lasagna! Spread a layer of sauce in the bottom of your slow cooker. I use a 6 quart slow cooker for this recipe. Sprinkle about 1/3 of your ground beef over that followed by cheese. Then add more sauce. 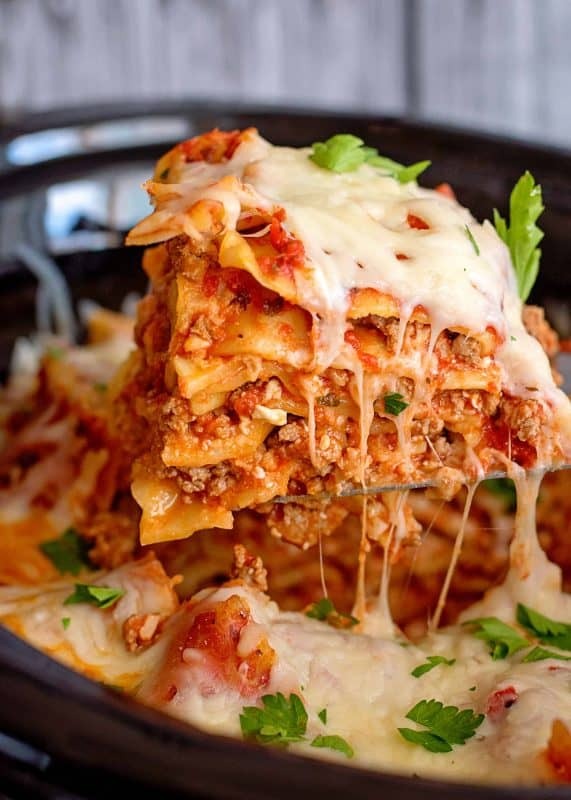 Break up lasagna noodles to cover this (see photo)* and then repeat until all of your ingredients are used. I usually end up with three layers and for cooking, I end with sauce and top with more cheese before serving. Cook this on low for 6-7 hours. *Important. 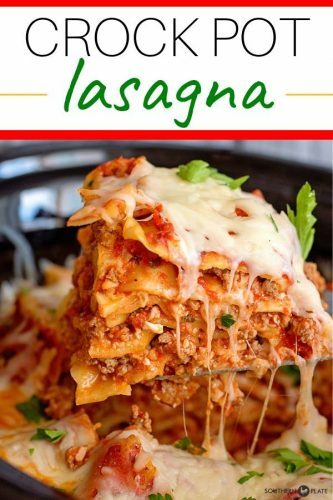 To help your lasagna come out prettier, alternate which direction each layer of noodles go. Trust me on this! You can see a demonstration of this in the photos above. I like to top with more cheese right before serving, but if your brood isn’t as into cheese as mine, you don’t have to add anymore. My husband likes cheese so much that his beloved grandmother used to always accuse him of being part rat! Put this on the menu as soon as you can! You won’t regret it. In bowl, stir two cheeses together until well combined. Spoon a layer of sauce in bottom of crock pot. Add about 1/3 of the cheese mixture on top. Sprinkle small amount of ground beef over top of cheese. Top with a layer of noodles, breaking to make them fit. Be sure to alternate which way the noodles go with each layer. Top noodles with another layer of sauce. Repeat process until all ingredients are used, ending with sauce. Cover and cook on low 6-8 hours. You can also cook it on high for about 2 1/2 - 3. It cuts better (prettier) if you turn off the slow cooker and let it sit for about fifteen minutes before serving. If desired, top with another layer of mozzarella before serving. I originally posted this recipe in 2008. I’ve updated the photos and post to better show the beauty of the dish! This recipe is featured on Meal Plan Monday and Weekend Potluck! When I was growing up we had Egg Nog at Christmas – topped with nutmeg. One time I had an urge for Egg Nog (not during the holiday season). It seemed to me that it was very straight forward: just beat eggs in milk and add that stuff that floated on top. Salt and pepper I thought, since you put salt and pepper in everything. I had no idea the floating stuff was nutmeg! That was my first and last time to make Egg Nog from scratch, and it went out behind the lilac bush in the yard (where all our cooking mistakes ended up). That was a beautiful lilac bush, by the way. I’ve never done lasagna in the crock pot, but I think I’ll try it. I make lasagna from time to time. Will be sure to try the crock pot version next time! Thanks, Christy! My dad made chili one time with cinnamon instead of chili spice. He didn’t tell us till after we took big bites at dinner! Oh my goodness. I can’t even imagine but I have to ask…how was it? Well, I don’t recall finishing the entire bowl of chili. What’s funny is my dad read my comment here and then sent me a text thanking me for not using his name! I hope you enjoy it Diane!! I was a young 19 year old bride. My Mom had always made beef stew with tomato sauce, I had never had it the gravy type way. So making it for my husband it was about done and needed thickened. I use the flour and water, which thickened it, but made it look rather whitish brown, not very pretty. Sooooo, I got out food coloring drops and figured I could doctor it into brown. Let me tell you, I ran out of certain colors and before I knew it and the harder I tried, I ended up with blue green looking meat, potatoes and the carrots were an odd color!!! He got home from work and sat down to eat and looked at the bowl of stew and said: “What in the hell is this stuff?” I have to laugh now, some 40 years later. It looked awful but sure tasted good. That was my first experience with food coloring and beef stew….. I am laughing with you Claudia! LOVE it!! I once made grilled cheese sandwiches with single wrap cheese and forgot to unwrap the cheese. LOL. I love the new photos and the trick about alternating the direction of the pasta. I always spray my crock before adding food unless the recipe specifically says not to, so I spray befor making your lasagna. I miss the old blog post and how you talk about the way your Grandmama said “Eye-talian.” That link brings me back here. My grandmother always said that, too. And, I use Pam spray on the interior of the crockpot as well unless I use the liners especially made for crockpots. I have been making my lasagna in the crockpot for a few years now. It always turns out yummy but you do have to keep an eye on how fast it is baking. Mine is usually perfect at two and a half hours, cooked on high. 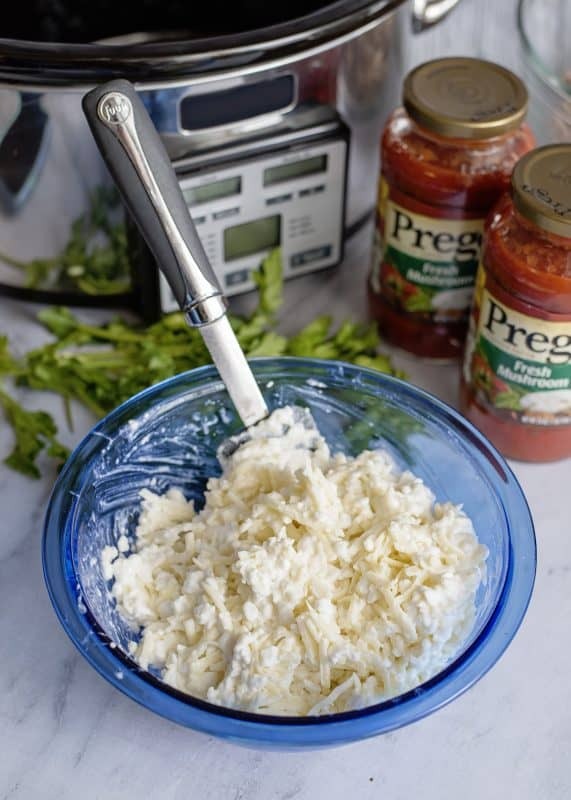 I make my cheese mixture from a combination of ricotta, shredded mozzarella, some Parmesan, an egg, and a few dashes of Italian seasoning to taste. I place two whole noodles across the pan and break two more, filling in on all sides with the halves. You get good coverage that way in a six quart crockpot. Also, I find it hard to get the cheese mixture to spread nicely so I “frost” my noodle pieces before placing them into the crockpot. Way back in the nineteen hundreds when my husband and I were dating, I made an ice box lemon pie. My church had just published our cookbook and I wanted to impress him. Well this recipe had a blooper and I had no idea. The pie was beautiful but so sour it was bitter. He came over for dinner and I served him a big slice of beautiful pie. I was chatting 90 miles and hour and he got a big bite. He didn’t gag and he forced himself to swallow as I’m chatting on and on – encouraging him to “enjoy it cold and eat up!” At some point I took a bite and that pie was so awe full I forgot impressing him and nearly gagged! Your lasagna recipe was a hit for my family. Thank you for another delicious recipe. I have been making lasagna in the crockpot for many years. I have a recipe that I use from a Cooking Light Superfast Suppers cookbook. It’s similar and I love lasagna from the crockpot. The flavors all meld so well together (as with so many crockpot recipes). At least with this crockpot, I cannot cook mine more than 3-4 hours without the edges getting too done. So be sure and keep an eye on it until you know how yours cooks with this recipe. As an aside, my recipe actually calls for ricotta, but I will generally substitute cottage cheese. I think it’s creamier and a nicer taste. And I’m the only one in my house that eats cottage cheese, but no one can tell in this dish, I promise! I have made other recipes and the pasta turned out gummy. Can anyone tell me why this happens ? Thank you. I love lasagna !! When my kids were young, they did not like cottage cheese either. Neither did my husband. So when I would make lasagna I always blended the cottage cheese in the blender so it was nice and creamy-no curds showing. They could not tell the difference and it was so yummy. Cottage cheese was so much cheaper than ricotta and I was on a tight budget. I still blend the cottage cheese 40 years later. And they’re still not the wiser. One of my funny stories about cooking was when I was a teenager I was mixing cake batter on the kitchen table with a hand mixer and wearing a loose blouse. All of a sudden my blouse got caught in the blades and it started eating up my blouse! I was yelling and trying to find the off switch when my Dad pulled the plug. That thing had eaten up my blouse all the way up to my throat! I was so scared, I thought the mixer was going to choke me. My family thought it was so funny. Haha. I will definitely try your recipe this weekend. Thanks. Oh Becky! That was truly terrifying. I’m so sorry for her. Bless you. I’m sure she learned to tie her hair back. I know I don’t wear loose clothing when I cook anymore. Hey Kun! I’m afraid I have never made it with anything other than those two. IF there is a creamy cheese you like, I’d suggest stirring that together with a grated cheese you like and seeing how that works 🙂 It’s worth the trial and error! I’ve made this MANY times from your previous listing and it is hands down one of my family’s favorites! I like it because it’s easy and I can put it in the crock and do something else all afternoon. Then, about 3 years ago I got one of the new 9×13 casserole crocks. It’s great in the oval crock but in the casserole crock, it goes to a whole new level. It cooks perfectly every single time and looks fabulous as well. It’s just my opinion, but the purchasing the casserole crock just for THIS recipe is worth it, though I use it for other casseroles as well. How many does this serve? I’ve looked and don’t see it. Thanks! Love the leisurely lasagna recipe. I even have the “stuff”. Thanks for the inspiration you bring on so many levels. I will have to try lasagna in the crockpot. My family love lasagna. Great idea to take to a pot luck also. This looks fabulous! We are a (mostly!) lasagna-loving crew. I’ll make some people happy and put this on the menu! Sometimes you have to repost a recipe so the good ones don’t get buried! I just put this recipe in my crockpot to bring to a potluck at work today, but I do have a question. I ended up with wayyyyy too many noodles left in the box – about 2/3 of the box! Why does it call for a 16-oz box when, with 3 layers, it only uses about 1/3? 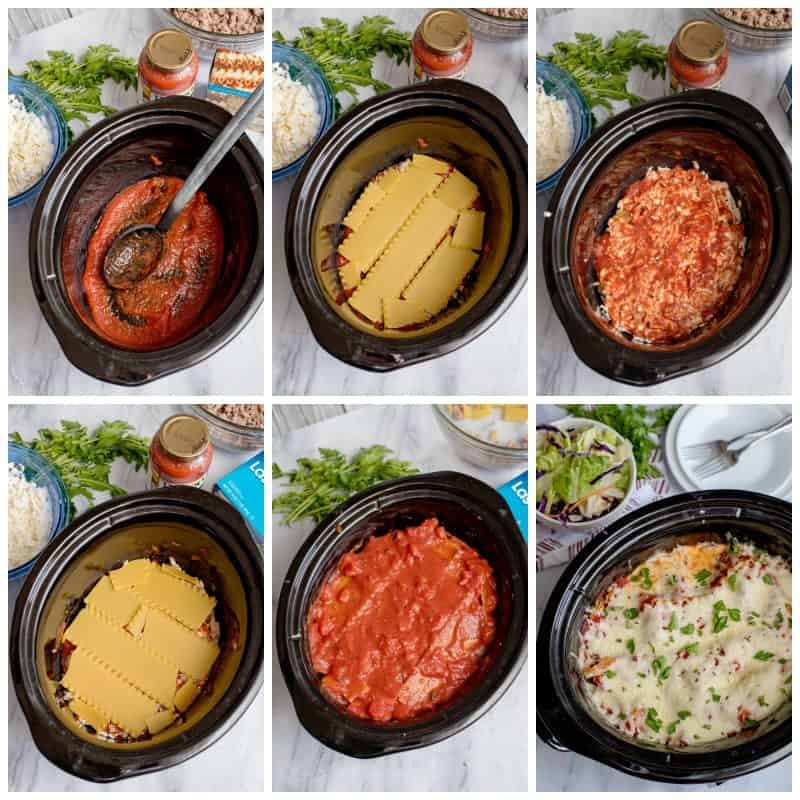 I used a 6-qt oval crockpot like the one pictured and alternated the layers as shown. It doesn’t look like you have noodles on top of noodles, so I only put one layer at a time. What am I doing wrong? I’m a little nervous! I made this on Saturday and realized as I started putting the first cheese amount that 1/3 probably wouldn’t work right if it is going to have the number of noodle layers in the picture. I change it to only have a scoop of cheese mixture and ended up with 5 layers of cheese and 6 layers of noodles. I had 2 noodles left in the box. I made this on Saturday and think that 1/3 of the cheese mixture probably isn’t correct or you won’t have cheese in each of the layers. I put a large scoopful of cheese and meat inbetween the noodles and had 6 layers of noodles total. I did think the lasagna could have used some more flavor. Maybe my spaghetti sauce was a little bland. I will likely add some Italian seasonings to the cheese layer and also increase the cottage cheese amount – adds a little more moisture. It was still very good! Thanks for such an easy recipe! The first time I made lasagna I was a new bride. I didn’t have a pan the right size, but I had a beautiful bowl with a rack to sit it in. I layered the lasagna in the bowl and baked it. when I took it out of the oven I set it in the rack, but my finger caught between the bowl and the rack. My finger was burning, and I used my nose to lift the hot bowl. I burned my nose! Oh my goodness, bless your heart! At least with this recipe there is no lifting it out of the oven! I was just 16 years old when I started shopping for groceries and cooking the dinners after school. I did not have any experience but could read a cookbook. Both parents were working then and I had always wanted to cook so I made the old standbys which I called my grandmother for directions and everything seemed to be at least acceptable to my parents and my sister. Then one evening I decided to make corn fritters for dinner. Everyone sat down and ate them with butter and syrup. When we were through eating, my dad said “ The dessert was delicious, now what’s for dinner?” I’ve never forgotten it!! I’m making your crockpot lasagne tonight for the first time. I’m hoping it turns out like everyone has said that it does. I’m sure it will!! Thanks for this easy, quick recipe. I love hearing stories like this!! Throughout life so many of our memories are connected to food, hearing others always makes me smile! I bet your Dad smiles at this memory every time it is mentioned! Enjoy the lasagna! !